Is it conceivable that President Obama might use the word “queue”? President Obama in a press conference, in London today, has said that if Britain votes to leave the European Union and makes separate application to the United States for a trade deal, she will be at the "back of the queue", behind the EU. On the BBC programme Any Questions this evening, Nigel Farage, leader of the UK Independence Party, and vehement supporter of Britain voting to leave the EU, said he thought it inconceivable that an American such as Barack Obama would use the word "queue". Americans, he asserted, say "line". So according to Farage, it was not Obama speaking, but, in effect the UK government had written his script for him. Do Americans use the word "queue", and more specifically does President Obama say "queue"? So, line is much more common in American English, especially when talking about a line that is actually physically embodied. However, queue is not unknown, especially among those with exposure to British English. Whether he was fed the line or doing it as a favor, I can't say, but it would certainly be more than reasonable for Obama to use the British-preferred word when discussing British matters, especially if he was 'aiming' it at a British audience. "Get in the queue, now," Biden urged viewers. "Get in the queue. There is still time today." February 25, 2010 Remarks in a Discussion on Insurance Reform at a Bipartisan Meeting on Health Care Reform: "Okay, all right. There were several people who were still in the queue who didn't have a chance to speak prior to us breaking." November 13, 2011 The President's News Conference in Kapolei: "Could I just say that Chuck's the only guy who asked two questions so far. So just--when I cut off here, whoever was next in the queue--[laughter]--I'm messing with you, Chuck." November 19, 2013 Remarks to the Wall Street Journal CEO Council and a Question-and-Answer Session: "We've got to make sure that we have a legal immigration system that doesn't cause people to sit in the queue for 5 years, 10 years, 15 years, in some cases, 20 years. " So, to answer your question, there's nothing unusual or sinister in Obama's use - it seems part of his idiolect. "Queue" was used, in the reported statement, in the sense of a "priority" ordering of the elements, and that sense is perfectly idiomatic US English. It's saying, in effect, that the UK would have the lowest priority. This is different from saying "I had to stand in line for hours to order the new iPhone." Mr. McCONNELL. We were able to process several amendments to the Keystone bill today, and there are now seven more in the queue and pending. Senators should expect votes related to amendments to this bill throughout the day tomorrow. With regard to moving forward on this legislation, I encourage Members on our side of the aisle who have amendments to come down, get them in the queue. We will have a number of amendments, as the majority leader has indicated, next week. The best way to proceed, if a Senator is on this side of the aisle and has an amendment, is to come on down and offer it and get it in the queue. Ms. MURKOWSKI. Mr. President, we continue to talk to Members on both sides of the aisle to set up a path toward passage on this bill that will include some amendment votes on pending amendments and others that are waiting in the queue. We will look to set some of those votes tomorrow after lunch. Mr. FRIST. Mr. President, today we continued debate on the Department of Defense Appropriations bill that we started before the August recess. We have three amendments pending, and we expect to have more amendments offered tomorrow. Votes can be expected before the weekly policy luncheons and throughout the day. We will work to finish this important spending bill no later than tomorrow or Thursday. Members who have amendments still to offer to this bill should consult with the bill managers to get their amendments in the queue. Again, I welcome my colleagues back from the recess. We have a lot of work to do, as I outlined earlier this morning, over the course of the next several weeks, and we can expect some very full days. "Line" is used rather than "queue" for these purposes in American English, but in a technical, rather than colloquial, context, the term "queue" gets used all the time. As an American computer programmer, I work with queues and queued data on a regular basis, and I would never use the word "line" in that context. But if a person is being sent to the back of something, it's a line, not a queue. Using the term "queue" in that context will definitely sound like a British-ism to American ears. As a software engineer in the US, I use the word "queue" all the time. Back when most people who subscribed to Netflix used the DVD delivery service, we called it a "queue." I think it's conceivable that the President, being a literate person, would believe that "queue" is the best word to use in this case just because it indicates a priority ordering. It is also conceivable that he knew who the audience was, and tailored his speech for them. It is also conceivable that he had a speechwriter or some other handler suggest that he use it, or that he was directly quoting something David Cameron asked him to say. It's all conjecture, but I think he very likely could have used the word "queue" for plenty of reasons besides "someone else told him to." Does President Obama say "queue"? Do Americans use the word "queue"? Do you know of any idiomatic alternatives for a phrase like "message queued for sending"? I can't think of any. That sentence already seems 100% idiomatic American English to me. So yes, most Americans would know what "queue" means. For a general british audience 'queue' and 'line' are certainly not synonymous. Most british people would understand it in context but it has much less impact as a headline. This is also different from things like faucet vs tap or fall vs autumn where the difference in transatlantic usage would be obvious. So this seems very much like a key phrase being disambiguated for the target audience. It is entirely possible that President Obama asked for advice on how best to phrase this, and it may even be a phrase that he had heard said to him. This certainly doesn't in any way suggest that it was a script written by somebody English. Indeed it would be strange if the president of the US didn't have advisors who would be able to fine tune prepared speeches in this way. In the same way that he would probably hold back on references to bacon and bourbon in a speech delivered in Saudi Arabia. Similarly even if he has some prompting on the wording it seems unlikely that the President of the US is going to be 'forced' to say something on this matter that he doesn't agree with on principal. Even if he asked an aide or a UK minister how best to say it he did, at the end of the day get up and say it himself. There are 358 speeches and press conferences by Barack Obama on this website. I'm not sure how they decide which ones to transcribe. Collecting all the speeches there, out of 1,162,735 words it seems he's publicly said "line" at least 130 times and never "queue." Anyway I think it's pretty common for politicians to make nods to local language. For example, there's a bit of Spanish in there too, like when he went to Cuba he referred to "un future de esperanza" [a future of hope]. 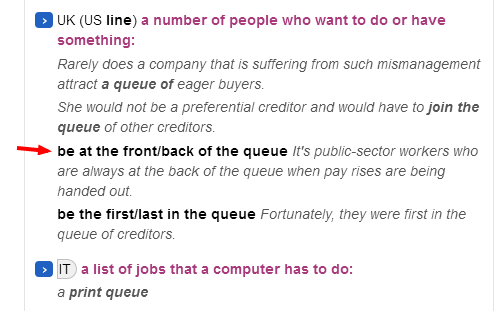 Edit: As pointed out by @slebetman, @tardy pidgeon's answer has some examples of Obama saying 'queue'. The press conferences in that answer don't appear in this database. As above, I don't know how the site selected the set of events that it did. I'm sure Obama knows the distinctions between British and American English on 'queue' and 'line'. He is noted for his oratory skills, so I am confident that he chooses his words in light of his audience. It is unlikely that he would use the word 'queue' speaking to an American audience, but I would be surprised to hear him use the word 'line' when addressing British media, especially in prepared comments. When a foreign head of state is speaking to US media, I expect them to speak some variety of English. What is so unusual about Obama speaking British English to the British? It's quite possible that politicians use different varieties of English in different countries. For example, Tony Abbott, who is generally perceived as less intellectual and less internationally-minded than Obama, and therefore less likely to use different varieties of English in different countries, nonetheless gave the following anecdote differently in a speech given in Australia compared to one given in Japan, which tends to use American English. In Australia, he used the Australian English "car parks", whereas in Japan he used the American English "parking lots"
Prime Minister Menzies for instance opened up trade with Japan at a time when Japanese cars were still banned from RSL club car parks. If Tony Abbott can use a different variety of English, it's very plausible Obama could as well. There was a ​long queue for ​tickets at the ​theater. Ngram: queue in AmE vs BrE. He DID say "queue". If I (British) visited New York, would I ask "Where's the elevator" or "Where's the lift?". Would you try to extract any deep meaning from my choice? Would I be accused of "cultural appropriation"? Is there any point whatsoever in this topic, other than a chance for us to display our political agendas? On this question, a swarm of Stack Overflow users and computer experts have talked about queries and queues, as if everyone knew what they meant. Specialized language is not the language of common folk, and this is true for university level mathematics and computer science jargon. Maybe very soon everyone will be familiar with these terms and how they are used, but what about today? It is a given that Americans will largely prefer: line, or line up over queue. So, who can say for certain that the US President Obama's expression choice “in the back of the queue” did not refer to the UK being physically, or metaphorically, "at the end of a line/queue"? • UK (US line) a ​number of ​people who want to do or have something: be at the front/back of the queue It's public-sector ​workers who are always at the back of the queue when ​pay ​rises are being handed out. Ergo Americans will prefer queue in technical situations. Likewise, computer scientists in anglophone countries will be familiar with its meaning of priority. Obama was simply repeating a warning made before by U.S. officials: that the U.S. is not interested in bilateral trade deals with individual countries, and that they would focus instead on deals with larger organizations like the E.U. However, the president's choice of words when making this point left many gobsmacked. The president of the United States had used the word "queue," typically used by Brits, rather than "line," considered the proper term in American English. Okay, it's certainly true that queue is used relatively rarely in American English: As the Oxford English Dictionary says in its listing for the word, it is a "chiefly British" word. But this isn't exactly a smoking gun. As James Ball of Buzzfeed UK was quick to point out on Twitter, Obama has actually used the word "queue" a number of times before. (2010) "There were several people who were still in the queue who didn’t have a chance to speak prior to us breaking." (2011) Could I just say that Chuck is the only guy who asked two questions — so far. So just — when I cut off here, whoever was next in the queue — I’m messing with you, Chuck." (2013) We’ve got to make sure that we have a legal immigration system that doesn’t cause people to sit in the queue for 5 years, 10 years, 15 years — in some cases, 20 years." …in none of the above examples was the president being used to trick British people to not act in their own interest. In fact, Obama has something of a habit of using British English. According to Not One-Off Britishisms, a blog run by University of Delaware English professor Ben Yagoda with the aim of catching the British English that enters into American daily life, the president has also been caught saying things like "full stop," "run to ground" and "take a decision." If you look at the entire quote, you'll notice that it already contains the word line (“down the line”). Maybe he deliberately chose to avoid using the same word twice (in different contexts) in adjacent sentences. US and UK English: queue or wait in line? Is the sentence “Queueing is so thoughtful of you.” grammatically correct? Use of the word “praxis”? When did the U.S. President become “Mr. X” instead of “President X”? What's the word that sounds like “procedures” in this recording? Is the title of a US President permanent?